Officer Sawyer Makes a Bust on "Lost"
James Ford is on the straight and narrow in "sideways" reality. Some things never change, even in the alternate reality that makes up much of “Lost” these days. Which is why it came as no surprise when this season’s Sawyer-centric episode opened with our shirtless hero pulling a fast one over on some unwitting female companion with whom he shared the night. But the oh-so-familiar scene stops there. In this version of events, Sawyer, aka Detective James Ford, is on the straight and narrow. He simply set up a con job to ensnare a real baddie. And with that, ladies and gentlemen, the alt-reality has gone about one twist too far to be believed. Sawyer? A cop? If buddy flicks have taught us anything, it’s that there can’t be an Officer Sawyer without a Partner Somebody, which is where Detective Miles comes in. No, really. The unlikely duo “Lethal Weaponed” their way through some shoptalk before the off-island plot finally reared its head. It seemed Sawyer really wanted to find Anthony Cooper so he could score some Lakers tickets — a lie that fooled no one from the get-go — and Miles would happily give his partner some personal space in exchange for one of those tickets and a blind-date favor. Sawyer agrees to go on the mystery date where he meets Charlotte, otherwise known as Faraday’s dead gal pal from last season. You just never know who you’ll meet in this reality. Come to think of it, this is a good time to stop calling it a reality at all, because frankly, there’s no reality in which people who look like Sawyer and Charlotte go on blind dates. 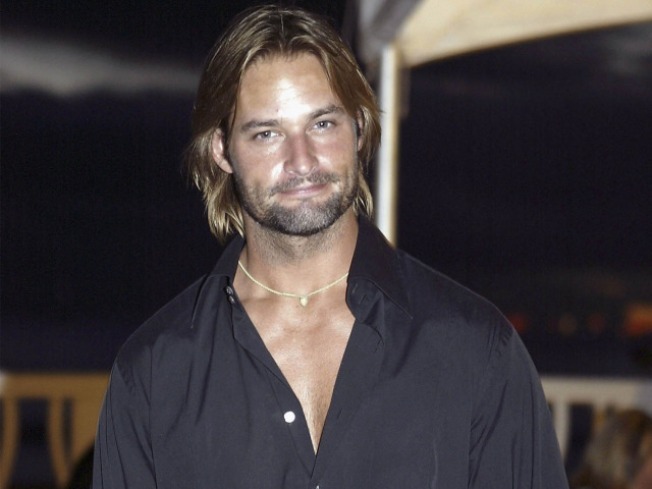 Shortly after their love connection, Sawyer left the room, leaving Charlotte to dig through his dresser in search of a T-shirt. That's where she unintentionally found his creepy family-themed, murder-suicide scrapbook. Yes, Sawyer may be a cop, but some history still repeated itself. His father killed his mother, then committed suicide after Anthony Cooper pulled an unforgivable con. On the plus side, Sawyer never swapped his inner demons for a life of crime. But sometime after he kicked Charlotte out of his home, Sawyer explained his ultimate and quite familiar mission to Miles. He hoped to find and kill Anthony Cooper. But that’s for another episode. Maybe. Because for some reason, after all of that set up, the only bust Sawyer made came out of nowhere when he caught a hit-and-run driver by the name of Kate. Wha? Back on the island, Sawyer and his partner in crime, Smokey (FauxLocke? Locke No. 2? ), had a chat about the recent blood bath at the Temple of Doom. This gave Smokey the opportunity to admit that in addition to being Locke’s doppelganger, he was also the resident smoke monster. Sawyer took the news well, and even agreed to continue doing Smokey’s bidding. So much for all those dead redshirts, and good luck sorting the good guys from the bad this season. This time Smokey’s request included taking a trip to the other island to get a lay of the land. Sawyer agreed. Once there, he found a pile of rotting corpses and one survivor. Well, not really a survivor. In fact, she could have been the killer, but all we know for sure is that she works for Charles Widmore. Convenient, as Widmore and Sawyer had something to talk about. Or someone — Smokey. Without asking Widmore what he wanted or why he dropped anchor, a confident Sawyer promised to deliver Smokey in exchange for safe passage off the island for him and his friends. Just don’t call Sawyer a turncoat. It’s important to note, he turned double-double-agent and told Smokey everything, only adding that Widmore’s group would be sitting ducks when he and Smokey turned the tables on them. Then again, Sawyer had one more person to share his story with in Kate. Apparently, his ultimate plan is simply to pit Widmore against Smokey and let the best baddie win while the rest of them go for a sub escape. At least that’s quite a plan. And not necessarily a good one. Sayid? Check. Sawyer? Check. Check. Ree Hines wonders when she can expect shirtless Desmond to finish off her “Lost” final-season bucket list. Follow her on Twitter and let her know which “Lost” moments you’re waiting for at twitter.com/ReeHines.